Aikido for me has been a big part of my life. It literally became the catalyst that changed my personality as I matured through my adolescence. It all started at 14, when I was lucky enough that while my older brother was studying Ninjutsu, he saw the value in what martial arts could do for me and my self-confidence. As a young teenager I was very quiet and timid. I was the youngest of 6 siblings. Being the youngest, I found I would generally compete greatly for attention, usually through spontaneously clownish actions. Moreover, being least senior, you find your opinions are either ignored or barely given a chance to be heard. Having accepted my place, I was for the most part shy. I can still remember in year 8 or 9 a student using the classic Robert Deniro line on me, “Are you talking to me?” I didn’t actually know it at the time but taking this seriously, in that moment I responded with, “No. Not me!” This was an exercise in the other boy’s authority and I had willingly submitted. I felt bad afterwards; I was afraid to speak up, let alone what to say. not forget, learning about himself. It was a series that groomed kids for an appreciation of Japanese culture. Sure, I’m more critical of them now but they were good films. From them, I wanted to do a Japanese martial art and was considering Karate like the main character of the films, Daniel. My brother was learning a para-military martial art designed to kill. Most martial arts in general too, are designed with an aggressive streak. Martial arts comes with ideas of using your strength, being aggressive, multiple combo hits and lethal strikes… In many ways a complete disregard to the person’s life that you are “competing against” (This in many ways represents the masculine extreme). I felt martial arts shouldn’t be treated like a game of Mortal Kombat (I know many martial arts don’t and most martial artists that train long enough, do not usually have this mindset). Nonetheless, I didn’t want to learn to be a trained killer. I didn’t want to have a lethal intent or an aggressive mindset. It was in my mind, the painted world of “Cobra kai’s no mercy. I wanted to approach martial arts with the question of “What would Mr Miyagi do?” Sure, he was a fictional character but to teenage me, he was the ideal. I remember glimpsing through the pages of an old martial arts book I found at my father’s house. Looking through the worn and faded pages of full spread images of fighting styles, I saw people wearing black samurai “skirts” placing locks on and throwing each other as well as using weapons. There was something appealing about this art. It boasted ideas of incredible power by being relaxed and focused and respecting your training partner. There was a deep spiritualism about it that I liked on top of the martial aspect. It held ideas for a negation to any form of competition, and a greater respect and appreciation of the workings of nature. I dug these things – It had a Mr Miyagi stamp of approval all over it. And then too it indulged my Japanese culture fetish by the art’s strong connections to Budo. It gave me ideas of the Japanese warrior class’ chivalry, which in a way fed my “samurai feudal Japan” fantasies as a teenager. This was Aikido. I knew I wanted to try it. My brother was a little dismayed at my choice, I suppose he wanted me to do something more brutal. A deal was a deal however, and I had the freedom to choose. Begrudgingly, my brother sponsored me. In hindsight, I was incredibly lucky for this. I remember finding Griffith Aikido in the yellow pages (yes, it was that long ago!). At the time, the dojo was at the QCA, in Southbank. It was a university club. I can remember the first night I went and watched these skirted people, gracefully throwing each other around the floor as though they were hovering. I was intrigued and decided to train. Occasionally, you would have conversations here and there on the mat. After training, they’d all go out for dinner and as I got older, I would go out and chat with all these awesome people about Aikido and whatever else. I was finally in a place where I was not competing to be heard, but instead just free to converse with anyone and neither did I struggle to find someone to train with on the mat. I felt included, like I was a part of a bigger family. At Griffith Aikido, I was a part of a club. Overtime, I came out of my shell. I had the opportunity to interact with others through the vehicle of martial arts. I became more confident with my martial skills which coincided with me having more confidence in general. This confidence also led to me to studying Drama in High school. I was still goofy me but I was not afraid to be myself. Instead of shrieking away, I embraced things. In hindsight, I don’t know if there was a greater thing a teenager like me could have had. This is not to say I didn’t have my share of problems. Most teenagers were trying to be something, competing with others to do so. Aikido taught me I didn’t need to compete to be something. I didn’t see the need, I was content that I knew who I was and found strength in this. 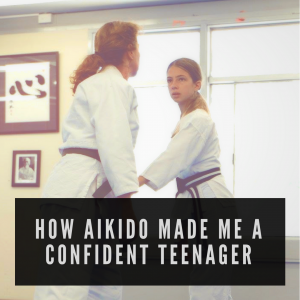 I have seen others like this pass through the dojo as well – shy and quiet to begin with, but through aikido, developed their own sense of confidence. Instead of recoiling inward they learnt to perceive outwardly and engage with the world. I liked engaging and communicating with other people. I have Aikido to thank for that. Later over the years, I even became a senior leader in my school. Sure, I wasn’t beating the local Cobra kai or getting the girl like Daniel but I was happy in being me.